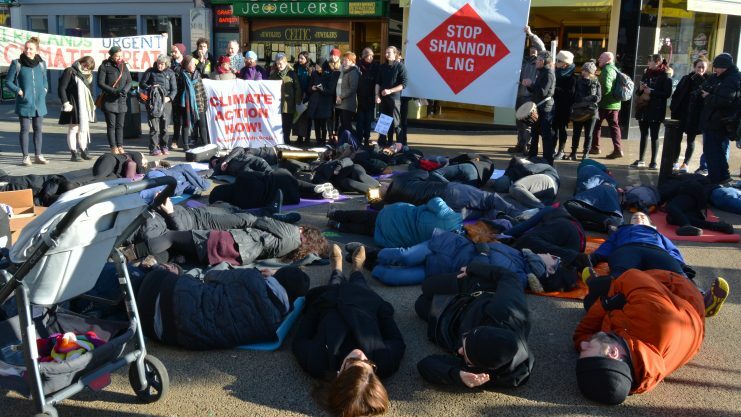 Dozens of protesters staged a ‘die-in’ at the top of Grafton Street on Sunday in opposition to the proposed development of a liquefied natural gas (LNG) terminal in the Shannon Estuary. Protesters directed their opposition to the Shannon LNG terminal’s potential energy supply of shale gas extracted through fracking with a chorus of “no fracking way, there are cleaner ways”. The weekend action, organised by a 13-group strong coalition, comes days before the High Court is set to issue its ruling this Friday on a case against the terminal brought by Friends of the Irish Environment. The project has been on hiatus for the past decade since planning permission was first granted in March 2008. A five-year extension was granted last year to allow a reasonable period for the completion of the project according to An Bord Pleanala. FiE argues that the Board’s decision to grant an extension for the proposed terminal in North Kerry ignores the State’s climate obligations and nature protections afforded to the site where the terminal would be built. According to Anne Marie Harrington of Futureproof Clare, a local campaign group opposing the terminal, building new fossil fuel infrastructure would be “antithetical to maintaining a safe planet”. “This proposed development would lock us into fossil fuels until at least 2050 at a time when we urgently need to be investing in the transition to a sustainable renewable energy system,” she said. The Irish state argues that plans for an LNG terminal correspond with the Government’s energy policy for at least the coming decade and would strengthen energy security. The draft National Energy & Climate Plan for the coming decade states that the development of an LNG terminal would “improve energy security by providing direct access to the global LNG market”. Both the National Mitigation Plan and the National Development Plan are also clear that Ireland’s future energy security is partly dependent on new gas infrastructure investment. Meaghan Carmody, head of mobilisation for Friends of the Earth Ireland, said that the Government’s position is “madness” as fossil fuel use, including gas, “must have all but ceased” within two decades as we move toward decarbonisation by 2050. “Decision-makers must live up to the fact that the people who have done the least to cause the climate crisis are being hit first and worst by the impacts, and we have a responsibility to play our part,” she said. 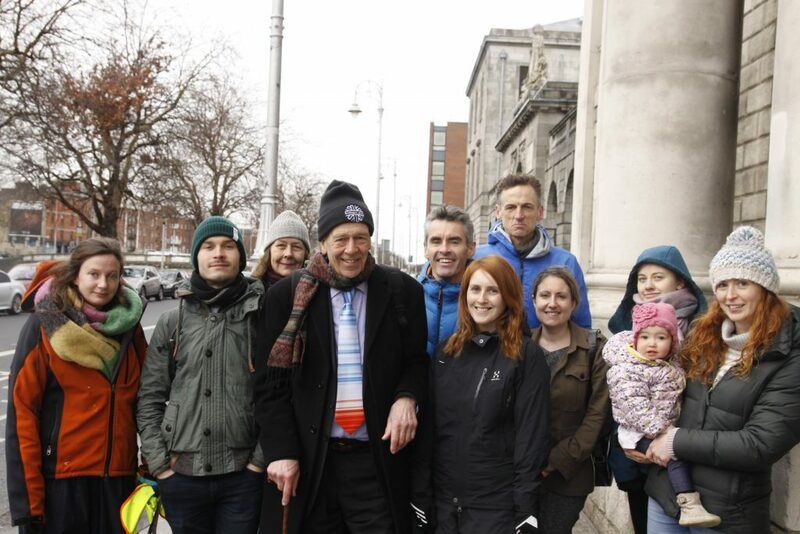 The newly established Extinction Rebellion Ireland was among the coalition that organised the event, with the group’s spokesperson Ciarán Ó Carroll pointing to a need for urgent citizen action. Die-in participant Kevin Tierney said that Sunday’s demonstration is just the tip of the iceberg in terms of further climate action to come.